With drop length options of approx. 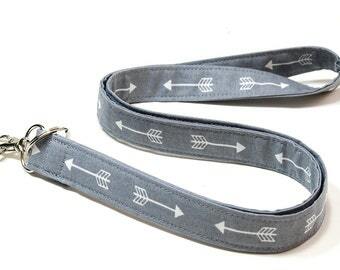 18 - 20 ", this stylish lanyard has been sewn to lay flat to your chest and can be comfortably used to hold your ID Badge, Keys, Memory Stick, Whistle, Phone or Security Tag. 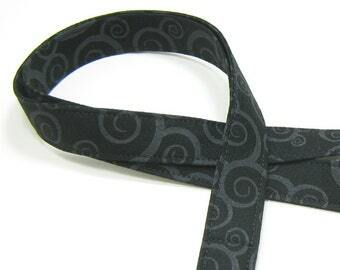 A lanyard provides a functional and unique gift for athletes, coaches, teachers, instructors, college students and medical personnel. To determine desired drop length, measure from the center back of your neck around over your collarbone down to center chest or abdomen where you wish the fabric length to end. 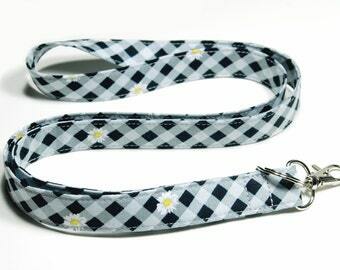 Stock Photo - The position of print on the lanyard will vary. 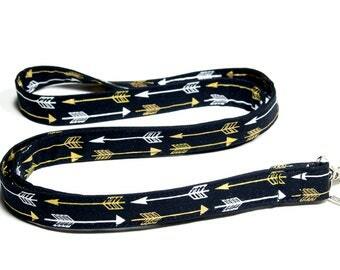 Detachable Lanyards are also available for purchase. 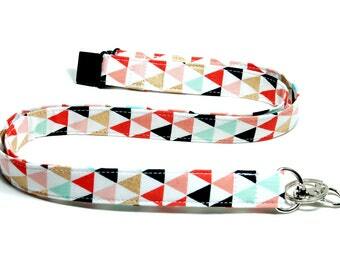 Coral and Gold Tribal Triangles Fabric Lanyard, Breakaway Lanyard Option, Double Breakaway or Detachable Lanyard or Key Fob Wristlet. Described as is. Fabric is super cute and well made!! Swaddle in Cloth accepts Etsy Payment Methods and Paypal. Any customs fees and sales taxes incurred in shipping internationally are the responsibility of the buyer so please keep this in mind when placing your order. No Vat Fees are included in the Swaddle in Cloth Listing or Shipping Price. In keeping with the law, all packages are marked as "merchandise". If you are not satisfied with your purchase within 7 days of receipt, please contact me and return it, unwashed, and unused, for a refund within 14 days of delivery. I will refund your payment once I am in receipt of the item. Lanyard hardware is warrantied for 6 months from date of purchase. Most US shipments will be mailed USPS via a third party courier/shipping broker with shipments made once or twice weekly. Parcels will be sent first class with tracking. All parcels are expected to leave Swaddle in Cloth on or before the expected shipping date. Orders are marked shipped on the day that they leave Swaddle in Cloth. There will be a difference of 1 - 3 days between the shipped date and the postage date due to the travel time via courier from Swaddle in Cloth to USPS. Canadian parcels will continue to ship via Canada Post. International packages will ship by Canada Post or USPS. Items are shipped to the address on your PayPal or Etsy address. The following is Etsy's information regarding processing times and shipping days. "Processing times are determined by the seller. If the seller updates processing times or marks the order as shipped early, Etsy will adjust the estimated arrival date accordingly." "Shipping days is the number of days it takes the order to ship to a buyer. Etsy gives sellers 2 business days for domestic shipments within any country and 10 business days for international shipments." 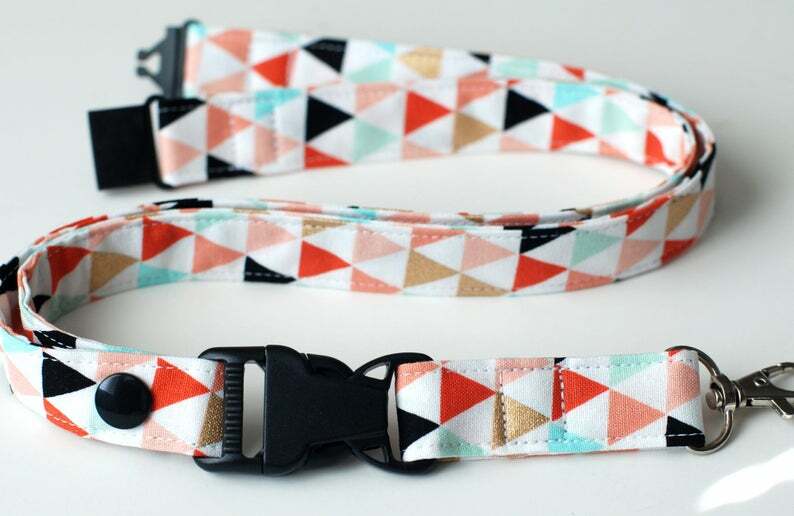 The performance of a breakaway clasp will vary and lanyards will not breakaway under all conditions and situations. Customers should test the breakaway feature for suitability for their use and environment. This product is subject to a limited warranty. Seller warrants to the original purchaser who uses this product that the goods or any component thereof will be free from defects in workmanship for a period of 6 months from the date of purchase. Seller's sole liability and the purchaser's sole remedy for a failure of goods under this limited warranty, and for any and all claims arising out of the purchase and use of the goods, shall be limited to the repair or replacement of the goods that do not conform to this warranty. There are no express or implied warranties covering these goods other than as set forth above.